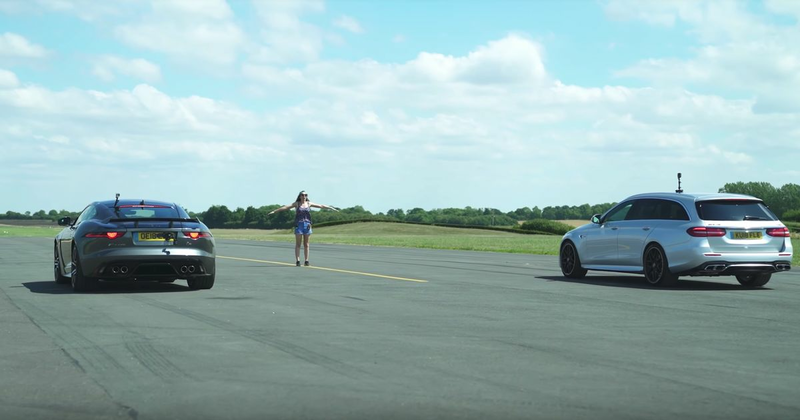 This is one of those drag races that involves what at first seems to be an odd pairing, but Caw Wow getting a Jaguar F-Type SVR and a Mercedes-AMG E63 S together on one runway makes more sense than you might think. For one thing, we all know the E63 S estate is stupidly quick, so why wouldn’t you want to see if it’s faster than Jaguar’s super coupe? Also, these two V8 monsters are very well matched. They’re both all-wheel drive, and while the F-Type isn’t exactly a featherweight, it’s still around 300kg lighter than the Mercedes, offsetting the latter’s power advantage. Then again, the E63 has launch control, while the F-Type SVR doesn’t. All of this makes for one very close race. Place your bets, then press play. And preferably plug in some headphones - it’s worth it for the noise of the F-Type’s 5.0-litre supercharged V8!